Have you ever wondered how to match that centre point on an eight star block? 1. Make sure your seams are all a perfect 1/4" or at least are all the same size - without that, you're going to struggle to get perfect points. 2. When making a block like this one which is paper pieced in 8 triangles, mark a 1/4" seam allowance on all the internal seams and a 1/2" seam allowance on the perimeter of the block on each PP template. This will give you the waggle room to trim to a perfect block at the end. 3. Sew the four pairs of triangles together starting from the centre of the block. Since you start at the centre, you are pretty much guaranteeing that that part of the seam will match accurately. If, by the time you reach the outside of the block, your seam has gone a bit awry, it's less important. 4. Press seams open and trim off the little pointy triangles. 5. Sew the four resulting squares into the two halves of the block starting from the centre of the block. 7. Now here's the magic. Align the final seam and take a pin and slide it vertically through the centre point on each half so they are pinned together at the exact matching point. Hold that pin through the two centre points vertically and carry the two halves of the block, with the pin sticking out vertically over to the machine. Slide the whole thing under the needle. Slide the pin out and slide the needle into the exact point the pin left. 8. Sew from that centre point to the outside of the block. 9. Flip and sew from the centre point to the other side of the block. 10. Press seams open and trim to size. You will be able to do this beautifully if you have added a 1/2" seam allowance to the outside of the block since that allows for the slight imperfections that result from assembling an 8-piece block like this. That is genius! I'd never have thought to start in the middle - brilliant! Marvellous tip - thank you! I'm always unsure as to what point to take the paper off. I've done it sometimes between your steps 4 and 5 and other times have left it until the end. Suggestions? I've picked up some good tips here, thank you! I always appreciate your blog posts, but this one will be particularly helpful to me. thank you. Your block is beautiful. Love that scrappy star. 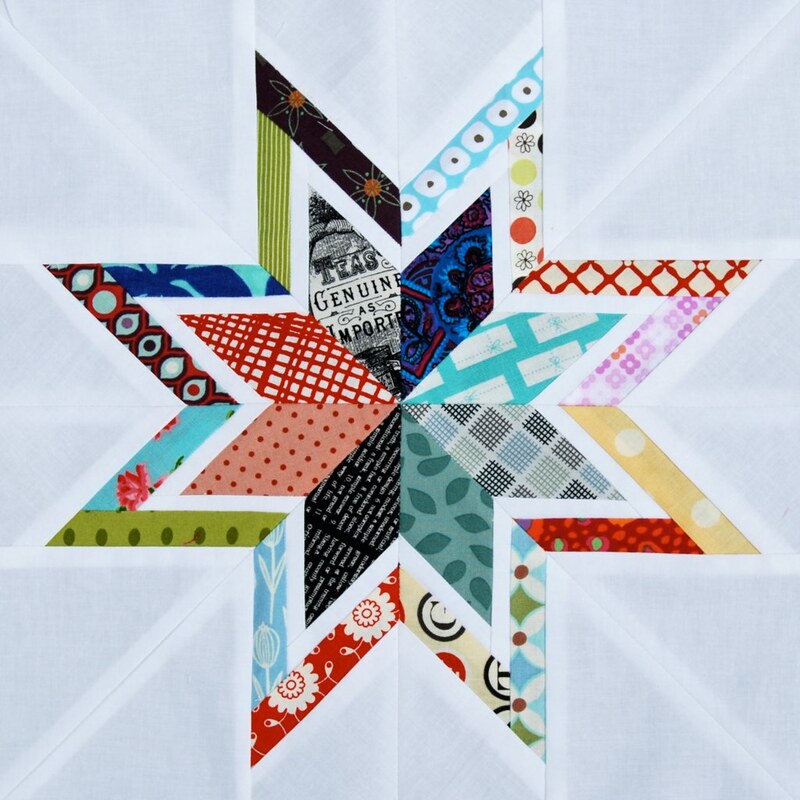 Beautiful Star block. Great tip about starting from the centre. Thanks. Beautiful star and I have tried this tip from you and it works great, thank you. I've never thought to sew from the center of a block before! Thanks for the tutorial. I love how this block looks and will have to put it on my "to do" list! That is a fabulous star. I am keen to give paper piecing a try. I will have to research tutorials. Do you recommend any in particular? I bet there will be one on craftsy.com. Heh, I do the pin sticky through thing (thinking I was the only nutter to do that), but hadn't thought to start sewing at the centre, thanks! Thank you for these great tips! I am just starting out on paper piecing and really enjoying it :) Can I ask if this block has a name or if there is a tutorial for it? I'd love to try it sometime :) Thanks! There is no interesting things in this article but very informative and of course useful to someone. Wow Majeda, you're direct, aren't you? Gotta love these comments that sneak through Google filters. Thanks Lynne, this came just in the nick of time. Stash Trad has become advanced paper piecing and my skills are definitely being stretched! That is a seriously genius hint!! I align the center with a pin, but it never occurred to me to drop the needle in there and sew from center to edge, and then center to the other edge. You never cease to amaze me! Can hardly wait to try this tip! Thanks so much. I'm linking to this post!